Caddy Cell 16ah lithium golf battery. This battery comes with a 3 Years warranty from date of Purchase. Purpose designed for use on any golf trolley that curreently uses a 12 volt lead acid battery, you dont need to make any changes or alterations as comes with an adapter cable. Weighs an amazing 2.1kg and measures 167mm x 125mm x 75mm to offer the smallest, lightest battery you could ask for. Lasts up to ten times longer than a standard lead acid golf battery. lead acid batteries give only 100 to 200 charges (18 hole Lead version) this battery will give 1000 to 1500 charges, and is 75% lighter than a standard lead-acid golf battery 30% the size of a standard lead acid golf trolley battery, This product has a 3/4 day delivery time. Comes supplied with its own Charger. 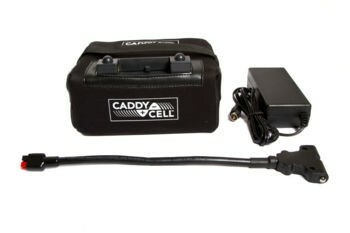 Caddy Cell 16ah lithium golf battery. This battery comes with a 3 Years warranty from date of Purchase. Purpose designed for use on any golf trolley that curreently uses a 12 volt lead acid battery, you dont need to make any changes or alterations as comes with an adapter cable. Weighs an amazing 2.1kg and measures 167mm x 125mm x 75mm to offer the smallest, lightest battery you could ask for. Lasts up to ten times longer than a standard lead acid golf battery. lead acid batteries give only 100 to 200 charges (18 hole Lead version) this battery will give 1000 to 1500 charges, and is 75% lighter than a standard lead-acid golf battery 30% the size of a standard lead acid golf trolley battery, This product has a next day delivery time. Comes supplied with its own Charger. Neoprene Protector pouch, 1x adapter cable to suit fraser and glider and powakaddy and 1 x guarantee card.